The Southwestern Athletic Conference got off to its typical horrendous start last season, as many of the teams in the conference played a brutal non-conference schedule and had unattractive records. However, it did eventually feature a decent league race, as it was not officially decided until Jackson State knocked off second-place Arkansas Pine Bluff on March 1. Jackson State won the league by three games over Pine Bluff, while Alabama State followed them. In the conference tournament, Jackson State was upset in the first round by Grambling, which opened the door for Pine Bluff to survive a couple of scares before knocking off Texas Southern in the title game. The Golden Lions went on to defeat Winthrop in the play-in game before falling to eventual champion Duke. This season could feature a repeat champ, but a wide-open conference tournament. 1. Jackson State: Last year’s regular-season champion will welcome back Grant Maxey, who sat out most of last season with an injury. 2. Texas Southern: Transfers Kevin Galloway (Kentucky) and Harrison Smith (Texas) join forward Travele Jones in a terrific trio. 3. 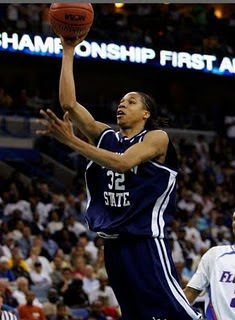 Mississippi Valley State: Preseason Player of the Year Shannon Behling will lead the way for four returning starters. 4. Alabama A&M: Look for the Bulldogs to be paced by the high-scoring backcourt of Cornelius Hester and Chris Cantey. 5. Grambling State: The Tigers could take a major leap forward this season on the backs of guards Donald Qualls and Lance Fuertado. 6. Prairie View A&M: Like last year, the Panthers will win with defense. Offensively, junior guard Michael Griffin has to improve. 7. Alabama State: The inside-outside duo of Tramaine Butler and Chris Duncan will try to get the Hornets back to the top. 8. Arkansas-Pine Bluff: The Golden Lions have a lot of work to do to get back to the NCAA Tournament after losing four starters. 9. Southern: The Jaguars struggled mightily on offense last season, and lose their top two scorers. Nick Walls has potential in the backcourt. 10. Alcorn State: The Braves won just two games a year ago and had the nation’s worst scoring margin. Ian Francis is the main man up front.